From July 17th to July 23th, spend certain amounts of Gold and be rewarded! You can view and redeem available rewards by clicking the “Timed Rewards” event icon in the top-right corner of your screen. Defeat the demons and protect the peace of the Enchanted Land! The invasion happens from 6:30 PM-7:00 PM (Server Time) on July 19th. From 7/21 - 7/23, every 200 Gold players spend in the Shop gets them another spin of the wheel. 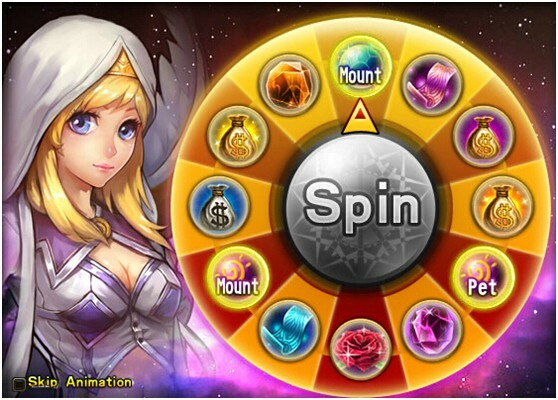 Each spin offers a chance to win valuable rewards, including Mount Evolve Pill x1, Pet Skill Upgrade Pill x1, Mount Skill Upgrade Pill x1, and more. Upgrade your spirit or the growth and aptitude of your pets or mounts for a chance to get special items that will make upgrades even easier. Click the “Upgrade Rewards” event icon for more details. - The Mystery Shop in the Eternal Spire will have more Spirit Protection Runes than usual on sale. - Stat bonuses will be obtained when all spirits have been upgraded to Lvl. 10, 15, 20, 25, 30, 35, 40, 45 and 50. Unlocked at Lvl. 68, card fragments can be collected and activated, filling out your card collection and improving your Battle Rating and character’s stats. Any extra card fragments you’ve collected can then be used to upgrade your cards’ levels. Check out the Cards section of your [Character] panel and the Magic Cards section of the [Forge] for more details. 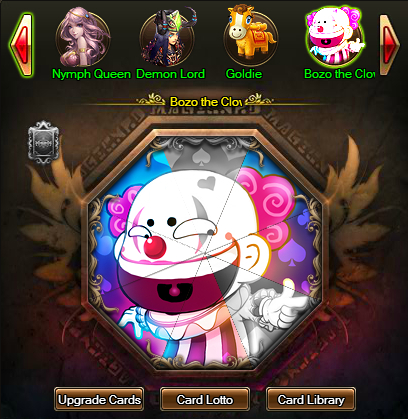 Bozo the Clown fragments can be obtained from the Card Lotto. Lottery is open from 19:30 to 20:00 on Tuesday, Thursday and Saturday. Lvl. 48+ players can join in the event and win Silver! X-server Guild Wars - Ready your guild for the ultimate showdown and show those other guilds who's boss! Description: Spend unbound gold and be rewarded! For the duration of this event, players who spend certain amounts will get bonus accessories and items. Rewards can be redeemed by clicking the “Timed Rewards” icon in the top-right corner of the screen. Note: Purchases made in the Market or with bound gold are not included in this event. Description: Prepare to be invaded! On July 19th from 18:30-19:00 (server time), waves of monsters will be storming the Enchanted Land. Level 40+ players who are up to the challenge must fend off a wave of these savage beasts once every six minutes, through a total of five waves. 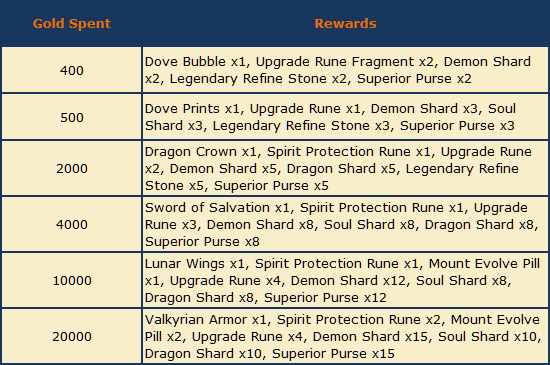 Rewards include Soul Shards, Demon Shards, Dragon Shards, EXP, and Sprite related items. Description: Feeling lucky? During this event, every 200 Gold you spend in the Shop gets you a spin of the Lucky Wheel. Each spin is a chance to win valuable prizes, including Mount Evolve Pills, Mount Skill Upgrade Pills, Pet Skill Upgrade Pills, and more! Note: Purchases made in the Market or with bound gold not included. Description: From July 24th to July 30th, upgrade your spirit or the growth and aptitude of your pets or mounts for a chance to get special items that will make upgrades even easier. Click the icon for more details. 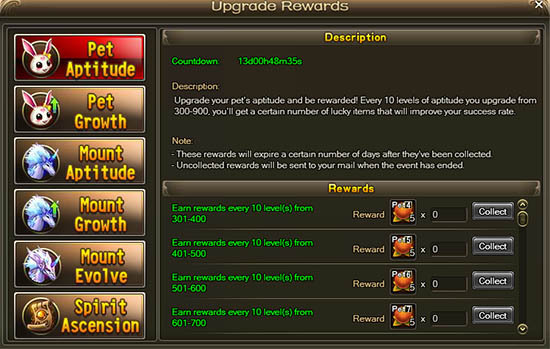 - You can collect 5 Luck Pills once for every 10 levels when you upgrade your pet’s aptitude or growth from 300 to 900. - You can collect 5 Upgrade Pills once for every level you evolve your mount or upgrade its aptitude or growth from 30 to 90. - You can collect 5 Spirit Ascension Luck Pills once for every level you upgrade your spirit from Lvl. 10 to Lvl. 45. - The max spirit level reaches Lvl. 50. Stat bonuses will be obtained when all spirits have been upgraded to levels 10, 15, 20, 25, 30, 35, 40, 45 and 50.